Kadir, a 34-year-old man, lives in a large city named Malatya in Turkey. Traditionally, the everyday life of big cities such as this one is barely seen through the rush. People are constantly coming and going, never spending too much time in one place, hurrying to attend a meeting or picking kids up from school. However, the busy people in this cosmopolitan city take a little bit of their time to support their fellow citizen- Kadir. Kadir is a well-known local. Unfortunately, he suffers from a mental disorder, but that doesn’t stop him from trying to fit in with the citizens of Malatya and their daily routines. 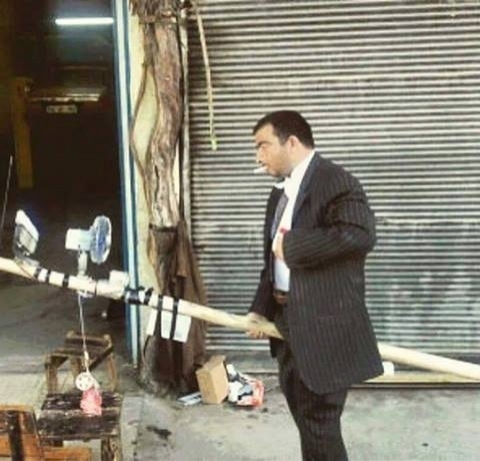 You see, he spends his day riding a 3-meter long wooden rod around town, thinking that it’s a car. The rod is complete with a rearview mirror and the Mercedes logo, which granted him the popular nickname Mercedes Kadir. The entire city of Malatya lives Mercedes Kadir’s story along with him. Every local in town knows him, and they go out of their way to help him. How? By respecting him. Mercedes Kadir “drives” his makeshift car every day, and he always follows the rules- he parks his “car”, he obeys the traffic lights, and other cars give him the right of way. Everybody seems to respect him as an equal participant in traffic. And why shouldn’t they? He received his own license plate (his numbers are 44 MK 444), drivers license, and insurance back in 2006. Even more amazing is the fact that the mechanics are in on it too, and they treat him and his “vehicle” as they would any other car when he brings it for a check. A few mechanics come together and help Mercedes Kadir maintain his car- they installed a music player, a fan, a rearview mirror, and they keep his Mercedes star clean and shining. Sometimes they check the “car” and talk to him, telling him about his “car troubles”. One of the favorite stories that locals like to tell was when a mechanic told Kadir that he’ll have to leave his “car” for three days to go over a few fixes, and when he came back three days later the mechanic jokingly told him it’ll take a few more days. The story went on for a while, the mechanic kept telling him it’ll take a few more days to fix the “car”, and eventually, like any other person, Kadir got frustrated- he told the mechanic that enough is enough, that he’s been walking home for the past two weeks. Police officers even stop him and write him a “ticket” when he’s going too fast or when he parks in the wrong place. Every once in a while we come across these stories in which a community comes together for the sake of an individual. Kadir is now an icon in the city, easily recognizable by every citizen and even tourists. While his general life has been influenced by his mental disorder, his everyday life is a routine that slightly differs from everyone else’s. He wakes up in the morning, “drives” to the city for a meal and tea, and goes back home at night. He’s a kind and pure soul, locals say, and it’s evident that he has the respect and support of the whole population behind him. Do you have any memorable tale of kindness that you would like to share with us? Tweet your story using @Fuzzable. Camila Carill launches her Bug Collection Jewellery range exclusively on OSC.